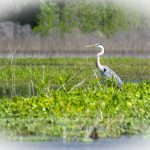 Paynes Prairie is a large 32 square mile wetland basin located between Gainesville and Micanopy, Fl. 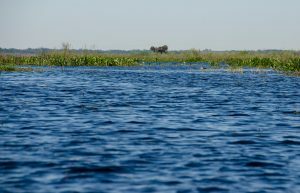 The Prairie primarily drains into Alachua Sink in the Northeast portion of the basin. 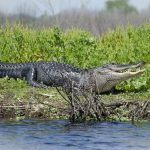 In 1871 this sink became blocked and for almost 20 years Paynes Prairie was known as Alachua Lake. 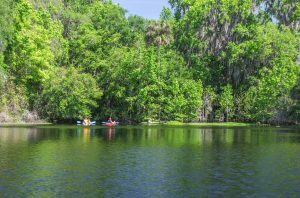 Steamboats were used on Alachua Lake during this time period and were eventually abandoned as the water levels dropped. 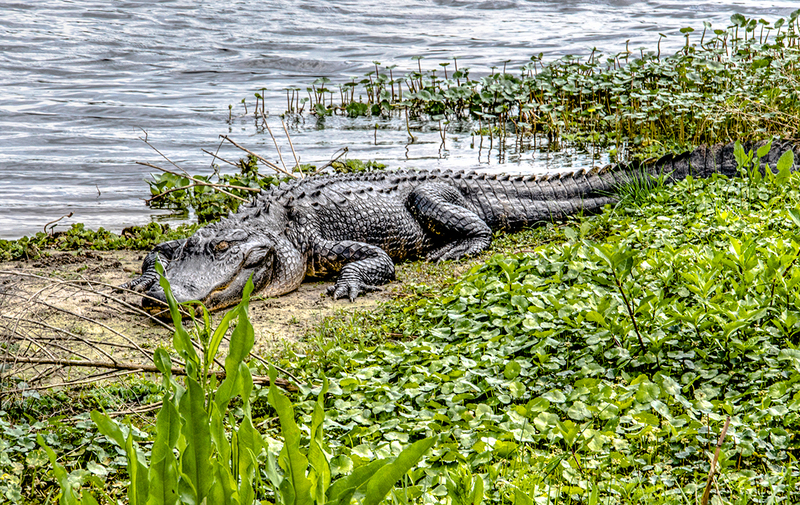 The majority of water on the prairie flows into Alachua Sink, and is a prime habitat for numerous Alligators dwelling in the shallow waters and along the shoreline. 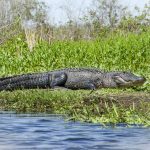 Location: Paynes Prairie is located South of Gainesville and North of Micanopy. 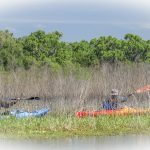 It is accessible from Paynes Prairie Preserve State Park, Sweetwater Wetlands Park and La Chua Trail. 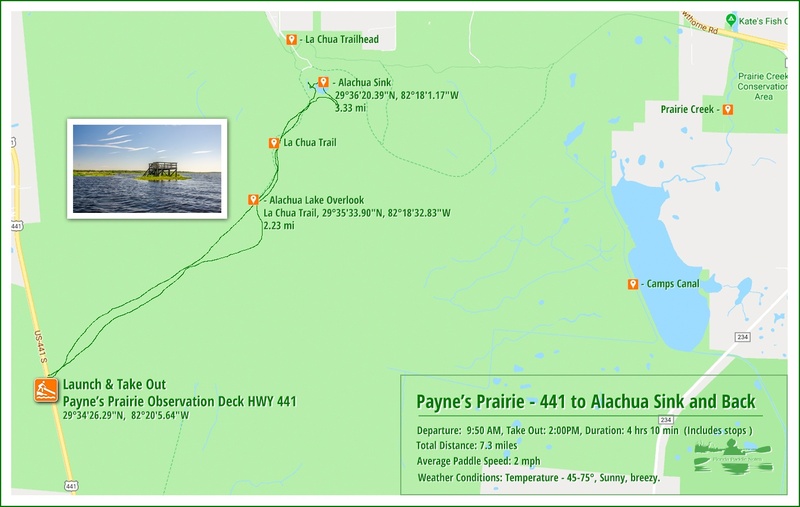 Launch point: The launch is located on northbound Hwy 441 at the Paynes Prairie Observation Platform, just under 6 miles North of Micanopy, 29°34’26.29″N, 82°20’5.64″W. This is NOT a typical launch point. 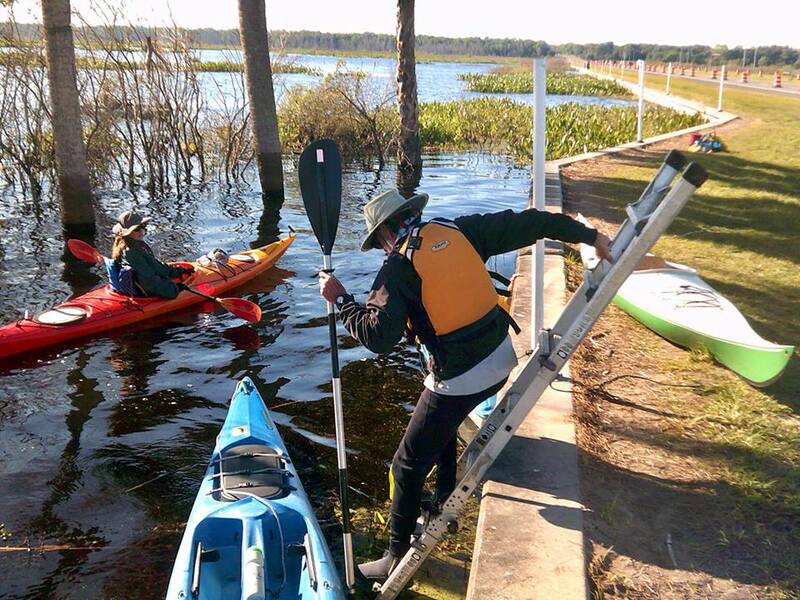 Even with high water, we used the aid of a step ladder to descend into our kayaks. Take out was a bit more difficult but we handled it well. Difficulty: Easy. 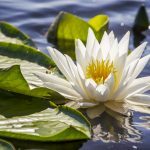 Does require knowing the direction to paddle in order to arrive at the La Chua trail. Average Paddle Time: We paddled this, during high water on a very windy day and were lucky to average 2 mph. 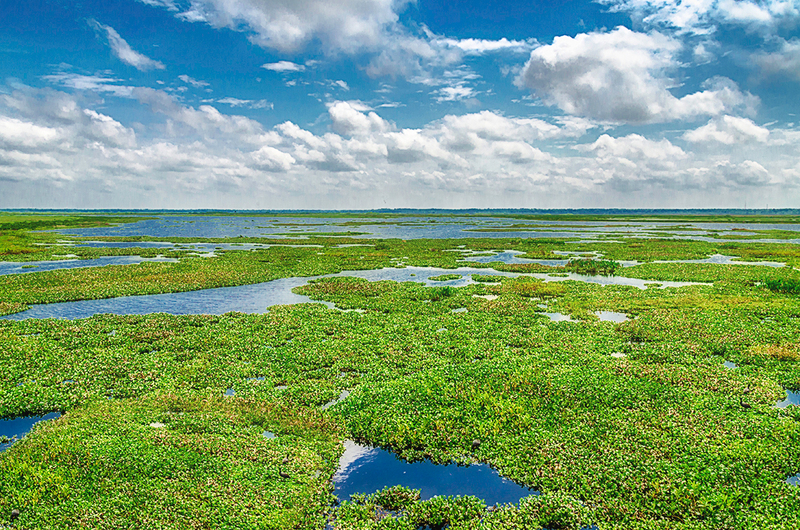 Width and Depth: This is an open expanse wetland. Water was no more than a couple of feet deep. 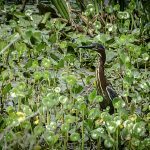 Current – Tidal: Fed by Newnans Lake/Prairie Creek and rainfall. Rest Areas: At launch there are no restrooms. At the 2.2 mile mark is the La Chua Trail observation deck which served as a rest area. Also at the 3.3 mile mark is the La Chua Trail Head and Observation walkway. Having arrived at the observation deck on Hwy 441 Thursday morning, we were second guessing whether to launch or not. It was a sunny morning, but there was a brisk wind blowing at us from the east which made the 45° temperature seem much colder. We all agreed it was a go. This was not the typical kayak launch. We were not sure if it launching a kayak from here was allowed, however no signs preventing us from doing so were posted. Again, we were a go! There is a concrete retaining wall bordering the prairie and the right of way of 441. The water level was about 3′ lower than the top of the wall which made for a tricky entrance. 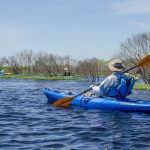 Using an extension ladder, we climbed down into our kayaks, loaded the ladder back in the truck and paddled to the end of the observation deck, headed northeast, knowing somewhere 2 miles out there, was the observation deck at the end of La Chua Trail. 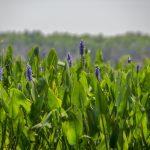 As mentioned earlier, in the late 1800’s, Alachua Sink became clogged for almost 20 years resulting in the prairie filling with water. During this time steamboats made use of the high water carrying goods and people. 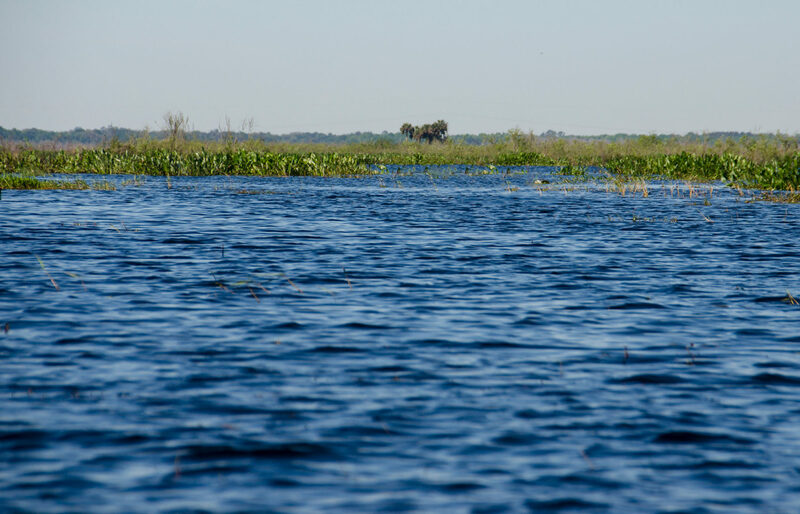 The prairie was then referred to as Alachua Lake and we were paddling on it. 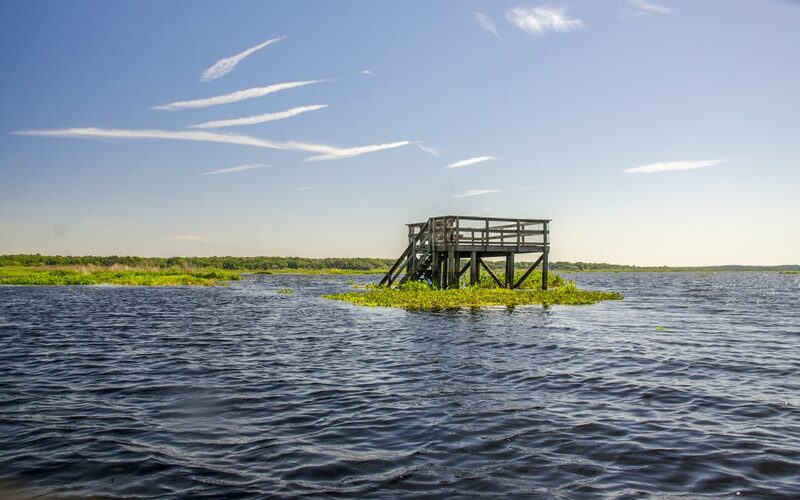 We paddled toward our first goal, the observation tower, against not only a stiff wind but in and around patches of vegetation that still remained above the water. The water was 2 -3 feet deep underneath us and the shrubs above water prevented any view of the observation tower. We relied on knowing we needed to continue northeast, and did so at a steady pace against the wind. The La Chua Observation Deck is at the end of the La Chua trail, a little over a mile out into the prairie. This was our first destination. After paddling for a little over 2 miles we looked to our left and saw the observation deck. Pretty much on course most of the way and a short correction to the left we reached the deck at 2.23 miles. As pictured above, the deck was half submerged in water. 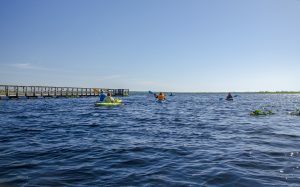 We paddled up to it and proceeded to exit our kayaks for a stretch, a bathroom break and a view of the prairie ie Alachua Lake. 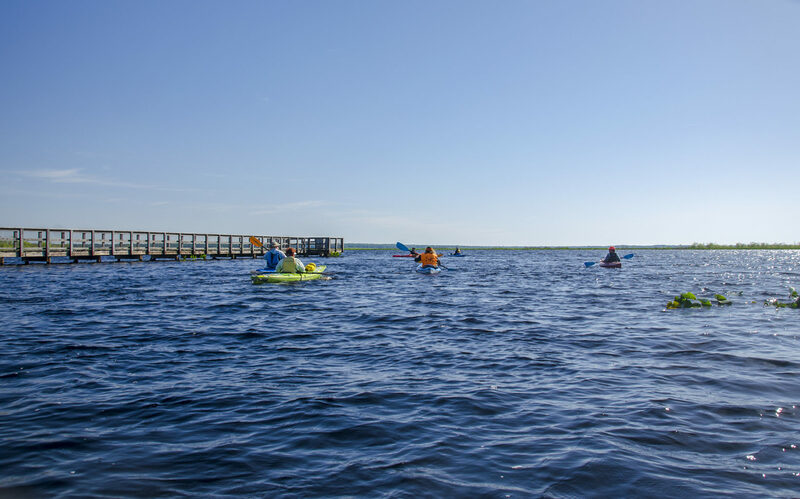 We knew it was a rare opportunity to be able to actually paddle to this deck and view Paynes Prairie this full of water. 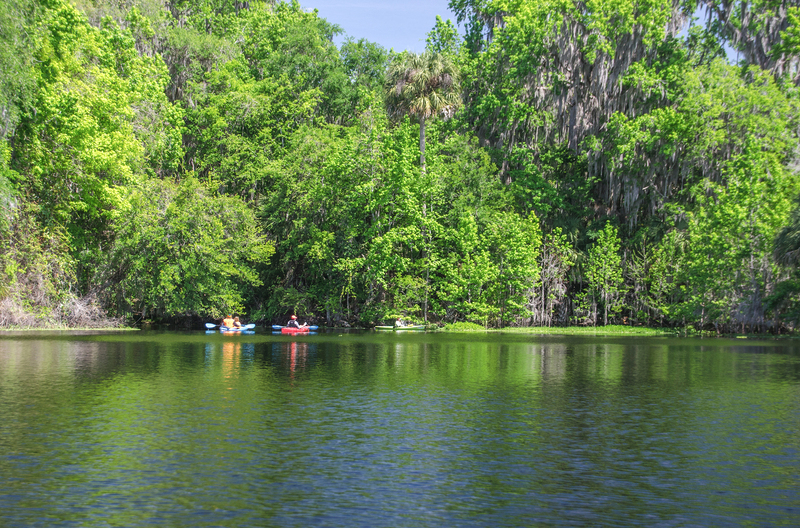 Savoring the opportunity, we rested up and proceeded to our next goal, the Alachua Sink. Leaving the observation deck, it was a unique experience to be paddling a kayak directly of the normally dry La Chua Trail! 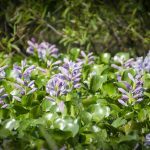 We actually followed the hiking trail on our way to Alachua Sink, the ‘drain’ of Paynes Prairie. 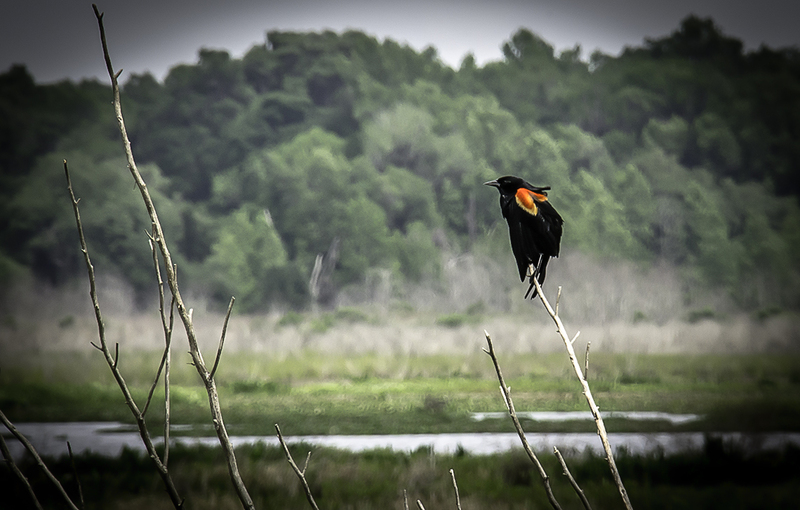 During this stretch, as well as the previous stretch, Red Wing Blackbirds heralded our arrival with their distinct familiar call. 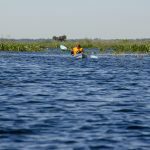 We paddled back and forth over the trail, through openings in maidencane and lily pads, dried, tall reeds and sunning alligators and arrived, 3.3 miles from the launch at Alachua Sink. The sink was beautiful, the fullest I have ever seen. In fact there was an immense difference from just 3 years earlier when I hiked the trail rather than paddled it. See photo below. We explored the newly accessible sink and headed back to the launch on Hwy 441. By now it had warmed up and the brisk breeze we fought paddling here was not at our back. 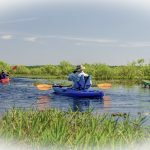 It was a pleasant paddle though tiring, over rare open water, around stands of Pickerel Weed and back on 441. 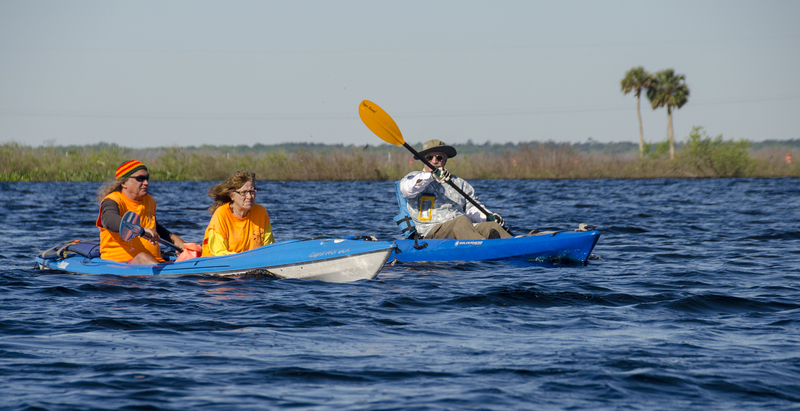 We experienced something many haven’t…paddling once again, on Alachua Lake aka Paynes Prairie. 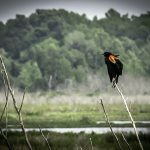 Interesting info about Payne’s Prairie. We camped at the state park a few years ago. Very interesting as I had driven thru it many times on the interstate. And it was very cool that we were paddling 3′ over the hiking trail that I just walked on 2 years earlier! We’re due to paddle this ago, as the water is still high.